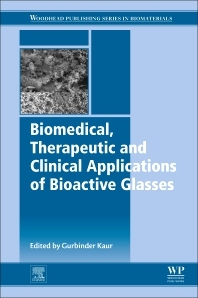 Biomedical, Therapeutic and Clinical Applications of Bioactive Glasses is an essential guide to bioactive glasses, offering an overview of all aspects of the development and utilization of this cutting-edge material. The book covers vital issues, including mesoporosity, encapsulation technologies, scaffold formation and coatings for a number of applications, including drug delivery, encapsulation, scaffolds and coatings. Readers will gain a strong understanding and practical knowledge of the therapeutic aspects of bioceramics, with a focus on glasses from a clinical point-of- view. Researchers, students and scientists involved in bioceramics, bone tissue engineering, regeneration and biomedical engineering will find this to be a comprehensive resource. Dr. Gurbinder Kaur holds her BSc (Hons. Physics) and MSc (Hons. Physics) from Guru Nanak Dev University, Amritsar. She moved to Thapar University, Patiala, to pursue her research work in the field of solid oxide fuel cells (SOFC) and received her doctorate in 2012. Her PhD dissertation was based on “Investigations on interfacial interaction glass sealants with electrolytes and interconnect for solid oxide fuel cells (SOFC).” She has four other books on “Solid Oxide Fuel Cell Components: Interfacial compatibility of SOFC glass seals” (Springer, New York), “Bioactive glasses: Potential biomaterials for future therapy” (Springer, Germany), “Clinical applications of biomaterials: State-of-the-art progress, trends and novel approaches” (Springer, New York), and “Modern Physics” by McGraw-Hill Pvt. Ltd. She has also carried out research in the field of Biomedical Engineering and Bioglasses. She is a recipient of fellowship under the RFSMS scheme of University Grants Commission (UGC). She has also received fellowship under Women Scientists Scheme, DST, New Delhi from 2010 to 2012. After completing her Doctorate, she moved to Virginia Tech, United States to work as a Postdoctoral Fellow with Dr. Gary Pickrell. She is a recipient of Postdoc Scholarship from UGC, New Delhi, for pursuing her research work in the field of bioglasses. She works on a variety of different materials and applications including high-temperature energy materials, bioactive materials, and optical materials.